This first week I started with attending an open hour on Monday, which was awesome I got to meet members of the community and we discussed about Usability Feedback for PublicLab . Discuss is a bad term to use because I mostly listened in rather than gave ideas. But it was great to hear and see how people use the site and what could be made better and interesting features coming up like the map for the content in the site. I created a milestone(Extend Community Statistics system) thanks @bansal_sidharth2996 for the suggestion. I like the milestone plan, I just have to keep adding my issues there and it makes me visualize the project more and I can track my progress because the percentage of completion increases with every closed issue. I realized in the end a lot is gonna change in the stats controller and me writing this code now will mean I will have to rewrite everything after I am done with the stats index page. Plus I also realized that the stats controller required a some refactoring. Time was running out and I had to accomplish something for week 1 so I resulted to refactoring stats page#4147 and also implement issue #4137 which was on the questions page. This gets to give statistics on the questions asked versus the questions answered and can filter by a period say week, monthly and yearly. I do not expect a lot to change on this page during the project and this is an independent feature so implementing this seemed like a visible idea. But all was not in vain for the the raw data stats implementation. I preserved the code I had written to download the content on stats page as json and csv so that when the page is done i will just have to find the right place to insert my code and admins and moderators will be able to download the stats in json and csv format. Finish refactoring the stats controller. Thoughts on daru gem? I came across this gem daru which does analysis manipulation and visualization of data in Ruby. Any advice if we should consider incorporating it in the statistics page or if anyone has used it and seen its advantages. A version of this story by @stevie is published in Public Lab's Community Science Forum, Issue 15. Photos courtesy of Dr. Gloria Horning. After several iterations of stormwater projects in the New Orleans area, exploring monitoring tools and strategies, and the challenges with sharing out about localized flooding events, I was surprised to hear about the remarkable parallels happening with stormwater in Pensacola, Florida. Earlier this year, a mapping project in the Indian Bayou area highlighted the problems Pensacola Bay has with stormwater runoff from new roadway development, and friends at the Pensacola NAACP started talking to me about the stormwater flooding and wastewater contamination issues in the communities. Dr. Gloria Horning came to Pensacola more than eight years ago as an AmeriCorps volunteer following the BP oil disaster. She has worked with disenfranchised communities in CERT (Community Emergency Response Teams) training and has come to know, firsthand, the impacts of development, and subsequent flooding in her local community. "A quick glance into the stormwater problems of the recent past, is in the influx of building and housing construction, and the lack of construction of infrastructure. 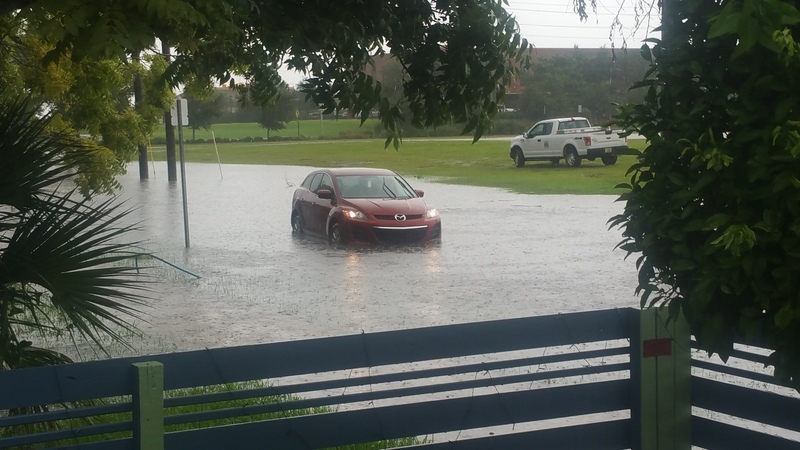 We have constant flooding in several areas, especially in downtown," says Gloria. "I live here, my house is impacted by it. We can have a ten minute rain event and my street will flood." 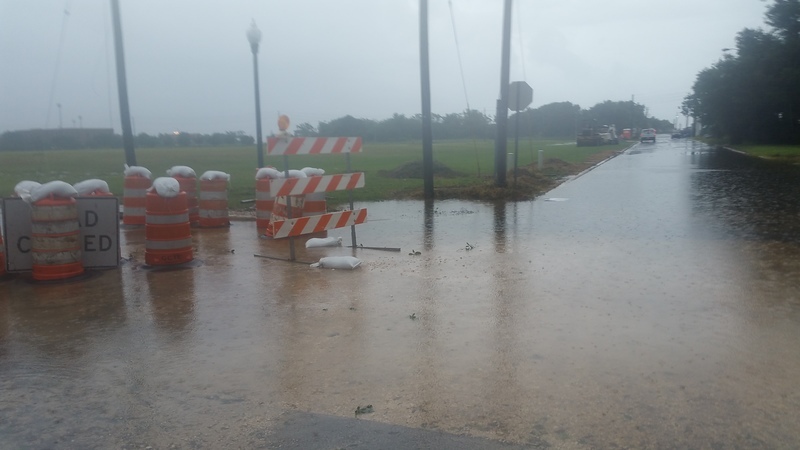 Early last summer, Gloria and a small group of concerned residents started down a new path to thinking about what a stormwater project in Pensacola could look like. Exploring the range of issues locally, researching past and ongoing projects, and thinking about outcomes they wanted to see, the group identified a main goal: raising awareness about stormwater issues in Pensacola and what people can do about them. 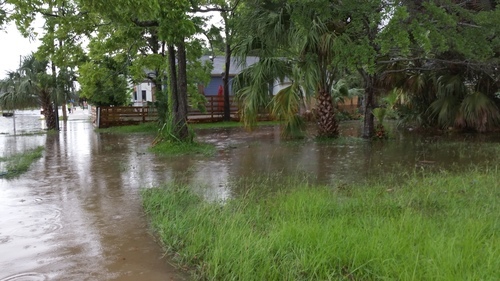 Runoff problems in Pensacola run the environmental gamut, especially in the historic Tanyard neighborhood, once home to the original port. It was also the site of a sewage treatment plant that was recently moved, but the transition has not been fully completed. The existing stormwater infrastructure runs alongside the sewage pipes; often when there's a problem with either system, both are affected. The result is raw sewage ending up in the stormwater, flooding the community, and spilling into the bay. A recent rain event sent 44,000 gallons of raw sewage into the neighborhood, littering lawns with toilet paper and feminine hygiene products that were never cleaned up. New development has further exacerbated the problem; the creeks running through the neighborhood and uptown have been filled in, paved over, and built on. Last summer, the city, expecting more housing development, resurfaced the roads, putting pavement on top of pavement. Not only did they not level the new pavement down to the existing storm drains, they also failed to do a pressure test on the road. The added pressure from the new paving burst the sewage pipe that ran underneath it, which had been put in by the Emerald Coast Utility Authority (ECUA) just one year before. From this event alone, 10,000 gallons of raw sewage flooded the neighborhood and a newly finished park, before draining into the bay. The oversight of Pensacola infrastructure is split between governing bodies. The ECUA manages the sewage system, the county oversees the stormwater system, and the city manages development. Gloria remarks that the distributed management leads to "a lot of finger pointing." The project that the NAACP and other partners scoped earlier this summer involves a campaign for how to clean storm drains, report flooding events, and educate on the sources of stormwater pollution. "I believe it is up to the citizens to understand what's going on, and to take action. We need to get more people involved---to go and clean the stormwater drains, to attend meetings, and to speak up," says Gloria. 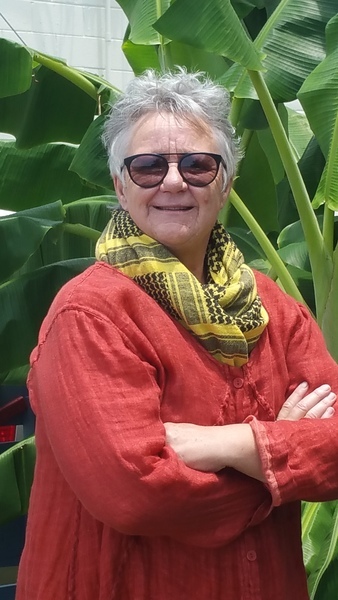 Dr. Gloria Horning, a community activist in Pensacola, is running for a position on her local utility board to help support her residents in her city. Even minor rainfall events are enough to flood neighborhoods in Pensacola, sending raw sewage into the community and out into the bay. A version of this story is published in Public Lab's Community Science Forum, Issue 15. New Orleans' Bayou Bienvenue Wetland Triangle was once a vibrant old-growth cypress swamp, used for everything from boating, camping, and hunting, to bird watching, fishing, and crabbing. It served a vital role in the lives of neighbors in the adjoining Lower Ninth Ward. But in the 1960s, the government wanted to create a faster route from the Gulf of Mexico to the Port of New Orleans so ships could avoid navigating the twists and turns of the Mississippi River to reach the city. The construction of a 76-mile long canal, the Mississippi River Gulf Outlet (MRGO), destroyed nearly 30,000 acres of wetlands and resulted in saltwater intrusion from the Gulf of Mexico into estuaries, killing the cypress swamps and decimating wildlife habitats. Erosion led to the MRGO quadrupling in width in some areas, affecting more than a million acres of coastal habitat. Even worse, a lack of infrastructure at the ports meant few ships ended up using the channel. Plans to improve the port were quietly forgotten in the 1980s. With a lack of wetlands to serve as natural protection, the MRGO exacerbated the storm surge during Hurricane Katrina, leading to levee and flood wall failures, devastating huge swaths of land in the Lower Ninth Ward and New Orleans East, and St. Bernard Parish further downstream. Its eventual closure in 2009 took place as a result of the recommendation put forth by NGOs and other key stakeholders. A Congressionally mandated plan was created by the Army Corps of Engineers to help restore the local wetlands to help protect the New Orleans area in future storms. But disagreements between the state and federal government led to lawsuits (still unsettled), with neither side acting to implement the proposed MRGO Ecosystem Restoration Plan. Widespread public support has enhanced restoration efforts, in spite of the legal stalemate, and the state is moving forward with pieces of the plan by using BP dollars in the master plan. "Our residents deserve to have the bayou restored; it's about creating a healthy ecosystem that can provide some storm surge benefits and recreation, as well as neighborhood beautification," says Happy Johnson, Chief Resilience Officer at the Lower 9th Ward Center for Sustainable Engagement and Development (CSED). 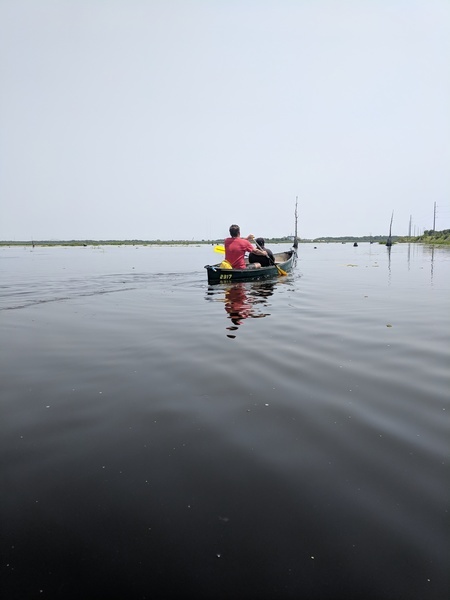 "Now that the Mississippi River Gulf Outlet has been closed with a rock dam for some time and the salinity issues are continually evolving, we are optimistic that the Bayou Bienvenue Wetlands Triangle can return to becoming a freshwater cypress swamp through the implementation of key restoration measures. But we have to stay vigilant in our application of engagement and advocacy. We're working closely with National Wildlife Federation, the New Orleans' Office of Resilience and Sustainability, as well as the state's Coastal Protection & Restoration Authority, to push forward comprehensive plans for restoration of the Triangle." The CSED was founded in 2006 in the aftermath of Hurricane Katrina to help residents of the Lower Ninth Ward rebuild their homes with sustainable and energy-efficient materials, with the help of volunteer and skilled labor. "Our founders sought to support the immediate reconstruction of the Lower Nine in a way that enhanced the health of people and the natural environment; they were also diligent in terms of protecting residents' rights to return," says Happy. "The neighborhood has a strong history of black home-ownership: the highest, at one point, in the entire city. We have fought to sustain the history and culture of this place." The organization is now focused on creating a sustainable, energy-efficient, and environmentally conscious culture in the ward, with major organizational milestones including the construction and maintenance of the Bayou Bienvenue Observation Deck, the coordination of 5,000 volunteers to rebuild homes and sweep streets, creation of a community garden, and serving as consultants for neighborhood and environmental restoration efforts in the area. 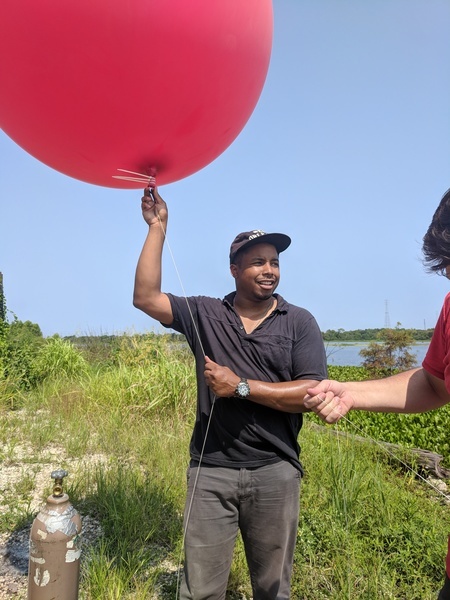 Happy joined members of Public Lab and the Gulf Restoration Network for a recent balloon mapping event on Bayou Bienvenue. 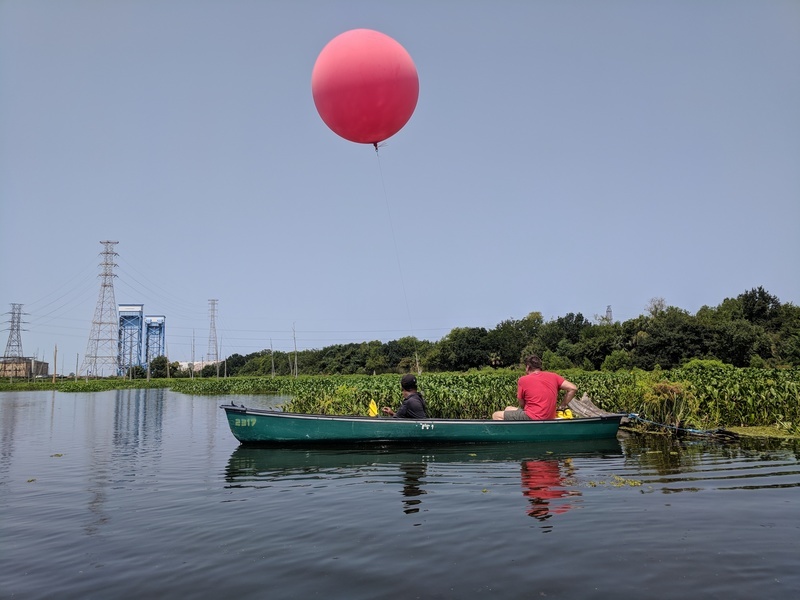 "Our staff wanted to balloon map because, while the boundaries of the Triangle have not changed, the ecosystem and wildlife habitat is constantly evolving as a result of climate change and recent hurricane safety measures that control the flow of water in and out of the ecosystem," says Happy. "We want to learn how to track these changes so we can share that knowledge with members of the community and empower them to do something about it. That's why we're out here mapping, and doing soil and salinity testing. "I'm proud to be a resident of the Lower Ninth Ward with a longtime history here," he continues. "Our residents are committed to a future that involves the complete restoration of our waterways and streets. The key for us with restoration is equity, participation, and inclusion. Design, planning, engineering, construction, and maintenance have to involve residents who live next to the wetlands. That's why we're working with government officials on how to better engage the community. If we try to rebuild the bayou without involving the people around it, then it won't be successful. We want to do this together, in an intentional way." A version of this story by @stevie is published in Public Lab's Community Science Forum, Issue 15. This year, many in the nation have turned an observant eye toward Africatown, a small community on the north side of Mobile, Alabama---first for excitement over the discovery of a sunken cargo ship that was thought to be the historic slave ship the Clotilda, and second for the publication of Zora Neale Hurston's national bestseller, Barracoon, which portrays a story of the people on that ship. But there are many other reasons to follow the happenings in Africatown. Many of the modern residents of Africatown are descendants of those brought to America on the Clotilda. American businessmen tried to smuggle in enslaved Africans, even though the transatlantic slave trade had already been abolished for decades in the United States. The end of the Civil War effectively freed those who had just arrived on the Clotilda, and many of those people settled on the delta shores just north of Mobile, Alabama, developing a self-sustaining and self-governing community that continues on today. The roots of community realization run deep, in spite of the many trials residents face, including institutionalized marginalization and exploitation. For those versed in environmental history, it's not hard to imagine what came next. In the years following the founding of Africatown, it became an industrial backstop for Mobile. The area had its first industrial development with paper mills. Then in 1928, a paper plant owned by International Paper opened an operation that poisoned the air, land, and water for many years. While this plant is now closed, there are others that followed suit, setting up shop in Africatown, and draining the community of the healthy natural resources on which it depends. In 2016, the community developed a neighborhood plan with the City of Mobile that outlines their vision for the community. Ramsey Sprague, president of the Mobile Environmental Justice Action Coalition, highlights this document as the driver for future development in the Africatown community. "When we started looking at that neighborhood plan, it was clear that residents didn't want any further industrialization of the land surrounding the community," says Ramsey. "Many people wanted access to the water. There were already several places where people fish and launch boats. People were already using the water, but they don't have the infrastructure there to support much of this type of access." The Mobile County Training School Alumni Association took this as a cue, and applied for technical assistance from the National Park Service. Together, they decided that a water-based trail would not only highlight some of the interest points along historic Africatown, but also connect the community to the isolated Africatown USA State Park in Prichard. "We wanted more green space, and fewer industrial real estate development activities happening along the waterfront," says Ramsey. "We wanted some type of process that would establish that the residents and surrounding neighborhoods utilize the water, and that they want more access, not less. The Blueway seemed to be a positive way forward to show decision makers that the community was serious about pushing back on the dead industrial real estate along the water, and that they wanted to see more activities that generated healthier outcomes." Once the group received technical assistance, they started reaching out to potential project partners. With two years of work on the Blueway, project partners span all sides: from local nonprofits such as the Mobile Environmental Justice Action Coalition (MEJAC) and Clean Healthy Educated Safe & Sustainable (CHESS), to the Alliance Institute, based out of New Orleans. There are foundation partners such as the Alabama Coastal Foundation, and larger organizations, such as the Nature Conservancy's GulfCorps program and the Mobile County NAACP. They have also brought in local government partners, such as the City of Prichard and County of Mobile. From a resilience building standpoint, this project stands on tall pillars through the support garnered by partners across many spectrums. Ramsey remarks, "It's an exhaustive list because we recognize we have so few resources. We don't want to neglect acknowledging any of the resources that have come to assist. 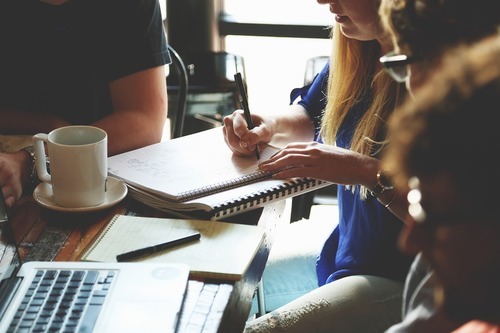 Most organizations and individuals in this process have contributed no money, but they did contribute ideas, relationships, and networking, and those types of things go a long way." 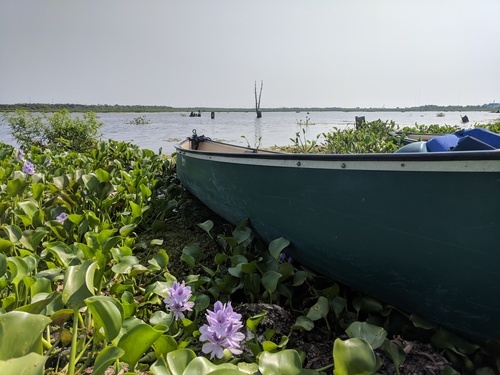 Partners at Mississippi State University helped to design plans for a boat launch site at one of the interest points along the Blueway under the Cochrane-Africatown Bridge. It's access points like these that MEJAC sees as a clear way to protecting and highlighting how people use the water. Ramsey affirms, "Sometimes there's an idea that the best or highest use possible for a piece of land is an industrial use. We wanted to push back on that notion, and say there are other uses of this land, and the community wants those uses established and built upon." Alongside the vision for a less industrialized waterway, the community is focused on other healthy outcomes highlighted in some of the fourteen interest points along the Blueway. "We're interested in learning as much as we can about the water that's surrounding us, and the soil, and the air," Ramsey shares. Part of the reasoning for the Blueway "is to highlight the area, so future research can further establish if there is peril over use of the waterfront, or danger in consumption of wildlife from water. It will help us begin that conversation in earnest. It's not an abstract thing. The community uses the waterfront and the water resources. They deserve to know, and they have a right to know, of dangers that lie in the water." These concerns are well founded in Africatown. Not only has the community faced massive industrialization, but industry have been notoriously bad actors there, to the point of litigation over chemical spills and cleanup. Through all the trials and hard work, Ramsey shares, "I look forward to exploring more with people doing similar types of work, so we can learn best practices and get ideas." But it's easy to see that from community mappings and ceremonies celebrating the waterway, to the multitudes of partners engaged, and the two years of organizing, there's a lot to learn from the Africatown that has surfaced on the national radar this year. This work signals the future the Africatown community wishes to see, and they're building a Blueway for others to follow. A version of this story by Hilairie Schackai is published in Public Lab's Community Science Forum, Issue 15. Photos courtesy of Hilairie Schackai. She is pictured to the left in the photo above. Twenty-five years ago I was preparing to be a farmer. Never did it occur to me that my career would one day turn to a crusade for rain barrels. But here I find myself in post-Katrina New Orleans offering build-it-yourself rain barrel workshops to promote a low-cost, low-tech green infrastructure approach to localized flooding and stormwater management. The first step in this direction took place in 2011, when I came up with the idea for the Gentilly Rainwater Harvesting Program. While working with a group called the Pontilly Disaster Collaborative, we commissioned an engineering study that found that if 15 percent of households in the Gentilly area were each to capture 100 gallons of rainwater from a storm, this could potentially alleviate "downstream" flooding at the Dwyer Canal in Pontilly. This finding sparked a realization that we can all take small measures, such as installing rain barrels, that collectively have a large impact. The idea of capturing rainwater to prevent flooding kind of turns the rain barrel on its head, so to speak. Most people think that captured rainwater is used mainly for watering gardens. But it can also be used to counter subsidence. By emptying the barrel after each rain event, rainwater is returned to the soil. Using rain barrels for flood control in this way offers a new view of the municipal drainage system, allowing people to take some ownership in how we manage rainwater. With a goal to eventually deploy 5,000 barrels in Gentilly to capture rain from storms, I developed strategies for promoting rain barrels. These included giveaways, presentations at neighborhood meetings, distribution events at strategic locations, demonstrations at area festivals and events, and group painting activities to decorate barrels. But the finest strategy of all was the backyard workshops---hosted by residents in the target area who would invite their neighbors. 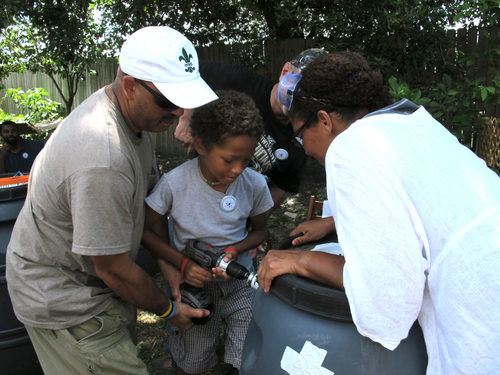 Building rain barrels together is surprisingly fun, even at the height of summer, as neighbors of all generations come together, swap stories, and occasionally exchange a few homegrown vegetables. In 2014, I joined with Water Wise NOLA, an umbrella organization comprised of Global Green, landscape architect Dana Brown, and myself. Specializing in green infrastructure, Water Wise is an education and outreach organization offering a variety of workshops and demonstration projects, as well as a program nurturing residents to take on leadership roles in their neighborhoods. Water Wise is currently focused on the Tremé and 7th Ward neighborhoods, with around 30 rain barrels installed there. We are also involved in other types of green infrastructure interventions, including rain gardens, bioswales, concrete removal, tree plantings, and more. Enter Recharge NOLA, a community benefit L3C social enterprise, named in part for the practice of returning rainwater to the ground to counter subsidence. Originally conceived in 2014 and ramping up in 2018, my Recharge model intensifies promotion of neighborhood-based solutions. While continuing to offer rain barrel workshops and demonstrations, Recharge will officially partner with neighborhood groups with the intention of increasing their capacity to proliferate the program. 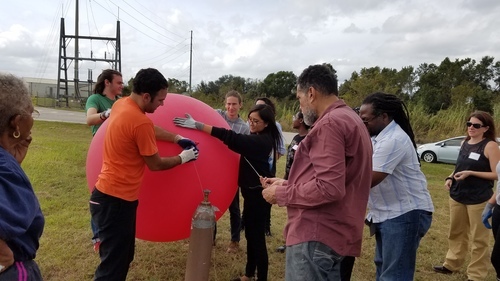 Essentially these partner groups---associated with targeted-area schools, churches, or nonprofits---will be operating Recharge Satellite Stations, where workshops can be offered, rain barrels can be purchased, and installations and routine maintenance can be scheduled for interested area residents. Opportunities for workforce training as well as entrepreneurial activities are available for those involved. All funds raised will be reinvested in the program and shared with the satellite locations. I am currently rigging a trailer, a Recharge Mobile Unit, to be used in materials delivery and, more importantly, as a pop-up educational display for school events and neighborhood festivals. A Tulane University graduate student (working through the Albert and Tina Small Center for Collaborative Design) and I will be designing the interactive and illustrative components. As I have come to believe, the humble-but-mighty rain barrel is not just a gateway into green infrastructure and stormwater management. 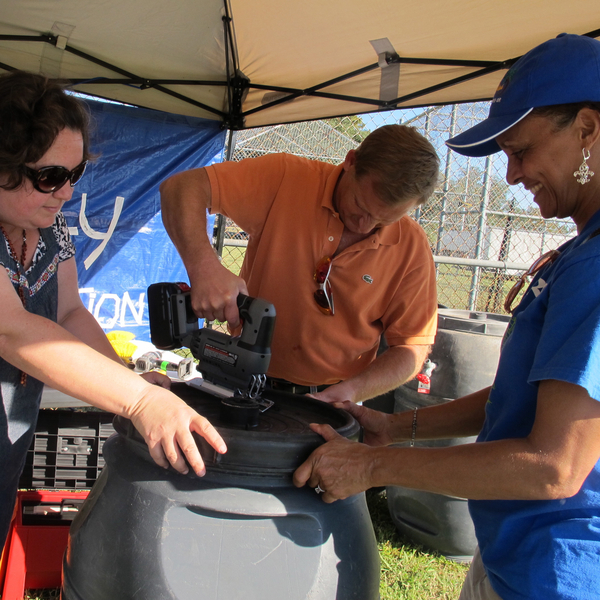 It is much more, as rain barrel programs provide a strong platform for social action and community engagement. For isn't it all about is building stronger communities through shared experiences with a common goal? The power of collective action for positive social change can be a beautiful thing. You can read Hilairie's 2015 manual, A Do-It-Yourself Guide to Simple Rainwater Harvesting: New Orleans, at bit.ly/NOLARAIN. You can follow Recharge on social media via Facebook at FB.me/rechargenola and learn more about Recharge with Water Wise at waterwisegulfsouth.org.